Published May 2, 2017 at 600 × 598 in New Church Art Dedicated!. 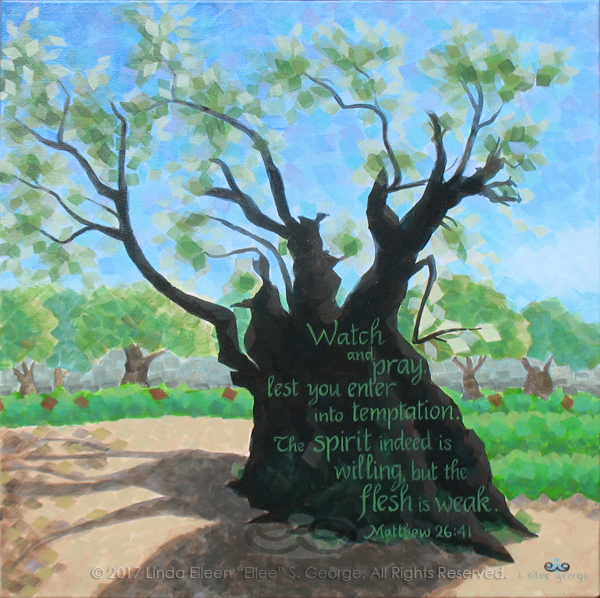 Digital photo of acrylic painting entitled “Ancient Tree, Gethsemane” © 2017 (Linda) “Eilee” S. George, 24″w x 24″h, part of the Israel Series for Calvary Community Baptist Church in Northglenn, CO; lovingly painted with squarish strokes in a Neo-Pixelist style in colors including ochre, cream, greens, blues, charcoal, taupe, sepia, gold, brown and white, depicting a tree in the Garden of Gethsemane rumored to be old enough to have been there during the life of Christ; includes the scripture: “Watch and pray, lest you enter into temptation. The spirit indeed is willing, but the flesh is weak.” – Matthew 26:41 signed L. Eilee George with logo – Eilee George of eileegeorge.com exhibits unique concepts and images of her own creation – this is a copyrighted image (and painting/detail) © 2017 L. Eilee S. George, All Rights Reserved. Not to be used in whole or in part or any derivative thereof, without strict written permission by L. Eilee S. George.